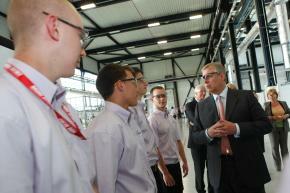 The Nuclear Advanced Manufacturing Research Centre (Nuclear AMRC) was officially opened today (28 May) by The Duke of York. His Royal Highness met with Nuclear AMRC staff and apprentices, and representatives from a wide range of manufacturing businesses, to find out how the Nuclear AMRC is helping them become more competitive. His Royal Highness has a continued interest in supporting facilities such as this that are a key part of ensuring that British businesses are at the forefront of science and engineering globally. The Nuclear AMRC’s research and operations are led by its industrial members – 34 companies are currently full members, from reactor providers Areva and Westinghouse, and top-tier suppliers such as Rolls-Royce, Tata Steel and Sheffield Forgemasters, through to specialised SMEs. 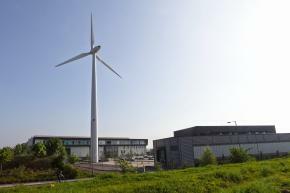 The Nuclear AMRC’s main facility is located on the Advanced Manufacturing Park, on the boundary of Sheffield and Rotherham, next to the established University of Sheffield AMRC with Boeing. Construction of the 8000 sq m centre was begun in November 2010, with Her Majesty the Queen donning virtual reality glasses to remotely activate a digger. The building was completed on schedule by October 2011, with the construction project managed by Turner & Townsend. It is now home to a growing team of engineers and researchers. The building was designed by Bond Bryan Architects to ‘Excellent’ BREEAM environmental standards. Power and heating is provided by a 99m wind turbine rated at 900kW and ground source heat pumps with 320kW capacity. 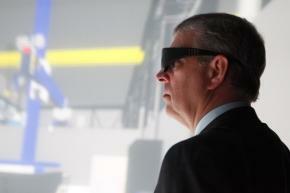 Following the opening of the Nuclear AMRC building, The Duke of York visited the University of Sheffield’s new Diamond Jubilee Knowledge Transfer Centre to meet local companies which have been in business for 60 years, as part of the Jubilee celebrations. 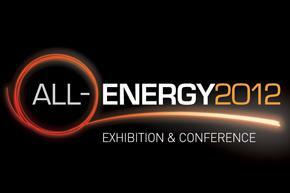 The Nuclear AMRC is attending the All-Energy renewables exhibition and conference in Aberdeen. All-Energy is the UK’s largest renewable energy event, showcasing the complete range of renewable and sustainable technologies. Professor Steve Court, Nuclear AMRC operations director, will take part in the Nuclear – Business Opportuntities in New Build and Life Extensions session from 11am on Wednesday morning, to highlight the opportunities in the nuclear sector for manufacturers engaged in offshore wind, oil and gas, and other energy sectors. Steve will also be presenting at NOF Energy’s Nuclear Networking Lunch on Tuesday 22 May. MANTRA, the AMRC’s unique travelling showcase for advanced engineering, will be outside the conference hall to present our manufacturing R&D capabilities for nuclear and other innovative energy industries. MANTRA is a customised 14m HGV trailer, designed to give young engineers a hands-on experience with real cutting-edge technologies including high-performance machining and virtual reality. The government has confirmed funding for a new skills centre for nuclear manufacturing, led by the National Skills Academy for Nuclear with support from the Nuclear AMRC. 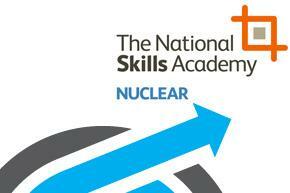 The National Skills Academy Nuclear – Manufacturing will create a single point of entry for employers. A dedicated team, based at the Nuclear AMRC’s South Yorkshire facility, will tackle the most urgent skills challenges facing the nuclear manufacturing industry. The team will develop training and skills products to help companies win new business, and expand the established High Quality Provider Network into the nuclear manufacturing sector. The new project is backed by the Skills Funding Agency at the Department of Business Innovation and Skills (BIS). It marks an expansion of the National Skills Academy for Nuclear (NSA Nuclear) into the nuclear manufacturing sector, with support from Semta, the sector skills council for advanced manufacturing and engineering, and the Nuclear AMRC. For more information, see NSA Nuclear.